Florida Book News: Can One Woman’s Business Model Make A Difference? 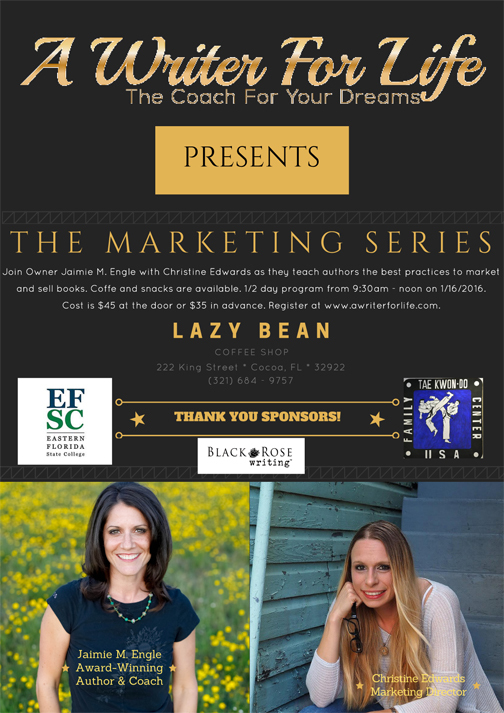 Award-winning local author Jaimie M. Engle to host marketing workshop on January 16th, 2016, from 9:30 – noon at the Lazy Bean Coffee Co., located at 222 King Street in Cocoa, Florida 32922. Engle owns the editing and coaching service A Writer For Life, LLC, where she has helped dozens of authors self-publish, traditionally publish, and market their books. Engle will co-teach the workshop with A Writer For Life copyeditor Christine Edwards, who is also the Marketing Director at HRSS Consulting Group. The Marketing Series is sponsored by Eastern Florida State College, Black Rose Writing, and Family Tae Kwon-Do, who have provided goodies for each attendant. Interested authors can register through the website at www.awriterforlife.com. The cost is $45 at the door or $35 for those who pre-register. Questions can be addressed to awriterforlifecoach@gmail.com. Jaimie M. Engle is the owner of A Writer For Life, an editing and coaching service for aspiring writers. She has written professionally since 2003 with publications in Space Coast Living Magazine and Florida Today Newspaper along with Writer’s Digest and the Dr. Laura Program. She independently published her anti-bullying children’s book Clifton Chase and the Arrow of Light in 2013, which won a BRAG Medallion in 2015, and she published The Dredge in 2014, an L. Ron Hubbard Writer’s of the Future honorable mentions. Engle ran the PR department for an independent publishing house, and shares writing techniques regularly at Eastern Florida State College, national conferences, Florida elementary schools, and area libraries. Her passion is to educate authors on marketing and publicity. When she's not writing, she's drinking coffee, playing trivia, or hanging out with her family. Christine Edwards is the marketing and communications director for HRSS Consulting Group. She is also a member of Florida Today’s freelance writer stable and a contributor to Space Coast Living magazine. In addition to this, her nonfiction work has been published by The Writer’s Cafe, Epicure & Culture and Senior Life of Florida, to name a few. Her fiction pieces have been published by Spark: A Creative Anthology, Haunted Waters Press, The First Line and a number of other publications. Her first manuscript features a new take on an old monster and is currently under consideration by two small presses. An educator by trade, Christine crossed over to editing and began teaching writers how to hone their craft in 2014. Since then, she has shared tips and tricks with numerous writers through her revisions, classes and speaking engagements. Christine enjoys drinking excessive amounts of artisan coffee and tea and helping creative types share their work with the world.